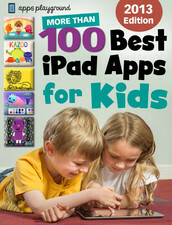 The UK-based Apps Playground web site, which reviews and rates child-friendly mobile apps across iPhone, iPad, Android and Windows Phone, has launched its first iBook – “100 Best iPad Apps for Kids”. Based on extensive research and in-depth reviews by the site owners’ two children, it pulls together the 100 best apps for kids across the categories of Creative, Education, Stories, Playful, and Games. With so many apps available in the iTunes store, some of dubious quality, it can be hard for parents to pick out the best ones for their children to use. The selected apps in this book include releases by well-known children’s entertainment brands like Disney, Nickelodeon and CBeebies, apps from new digital brands like Toca Boca, Duck Duck Moose and Sago Sago, and a host of independent developers. Recent research suggests that well over one-third (42%) of 5-15 year-olds uses a tablet computer at home, with 28% of 3-4 year-olds using them. It’s an important and precious market, which is why books like this can prove invaluable to parents who want their kids to embrace the latest technology without worrying they’ll stumble upon something unsavoury. Available for £1.99 in the iTunes Store.